So, you're pregnant. Congrats! Get ready for those lame lines about eating for two. Those jokes are tired, for sure, but in all seriousness, we do have to think a bit more about our nutrition when we’ve got a bun in the oven or are planning to conceive. The demands of a growing fetus can worsen existing vitamin and mineral deficiencies or even cause them, putting your unborn baby at risk for birth defects, developmental issues and other problems according to a 2016 study published in Nature Reviews Endocrinology. More than 2 billion people globally are micronutrient deficient, estimates the World Health Organization. People in developing countries are more at risk for deficiency during pregnancy, but even if you eat regular meals, that doesn’t mean you’re getting all the necessary vitamins and minerals to support your health and your child’s. Underlying conditions, complications with morning sickness or changing tastes and appetites while pregnant can create challenges in the attempt to eat a balanced, nutrient-rich diet. 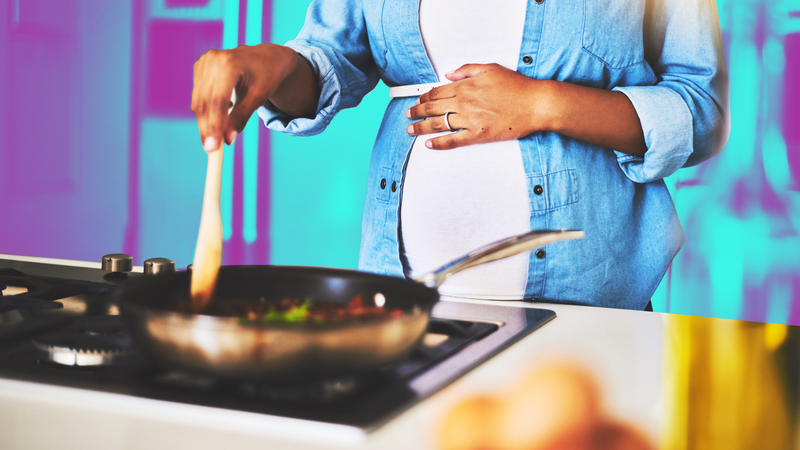 Below, we’ve outlined some of the most common nutritional deficiencies during pregnancy, their risks and how you can up your intake at mealtime. Up to 52 percent of pregnant women around the world aren’t getting enough iron according to a 2015 study published in Saudi Medical Journal — and iron deficiency during pregnancy can lead to anemia. For moms-to-be, anemia can cause fatigue, difficulty sleeping and breathing complications, and it increases the risk of infection, bleeding and preeclampsia, says the study. For newborns, iron deficiency can cause premature birth, low birth weight and even death. Babies born with iron deficiency anemia may remain anemic in their first year, which could result in developmental issues. Luckily, it's relatively easy to increase your iron intake by consuming lean meat and fish. Many breakfast cereals are also fortified with iron, and you can also find this micronutrient in chocolate, lentils, spinach, white beans, chickpeas, tofu, green peas, cashews and potatoes with the skin on. When you’re pregnant, your body’s demand for the thyroid hormone increases, and that means you need a healthy supply of iodine. An iodine deficiency can increase the risk of miscarriage or of neurological or psychological impairments in your baby according to a 2012 article published by Endocrinology and Metabolism Clinics of North America. Attention deficit hyperactivity disorder is one such concern, says a 2004 study published in the Journal of Clinical Endocrinology & Metabolism. We get a lot of our iodine from iodized table salt and from cow’s milk (as a result of cattle feed supplementation and sanitization processes). But what happens if you’re on a low-sodium diet, skip out on dairy or you opt for sprinkling sea salt, which contains no iodine, on your plate. Choosing milk alternatives like almond or coconut instead of cow’s milk could put you at risk for an iodine deficiency, says research published in the British Journal of Nutrition. For more iodine options, eat foods like prunes, eggs, seaweed and cod, as recommended by the National Institutes of Health. Your body’s demand for folate, also known as vitamin B9, increases during pregnancy because this micronutrient is essential for fetal growth according to a 2011 article published in the journal Obstetrics & Gynecology. Folate protects your unborn child from neural tube defects that harm the brain, spine and spinal cord and occur at early stages of pregnancy. And for expectant moms, a folate deficiency can also lead to anemia and neurological concerns. You can increase your intake of folate by eating liver, dark leafy greens, asparagus, Brussels sprouts, avocado, broccoli, eggs, oranges, papayas, bananas, peas, beans and nuts. Many breakfast cereals, pastas, rice and baking supplies like flour and cornmeal are fortified with a synthetic version of folate called folic acid. In the late 1990s, both the U.S. and Canadian governments began requiring food manufacturers to fortify certain foods with folic acid, and several other countries followed suit. Even though general folate deficiencies are now rare in these countries, pregnant women are still at risk for not getting enough, according to the National Institutes of Health. Talk to your doctor about any concerns, especially if you’ve been sticking to a gluten-free diet or eating fewer grains. A vitamin D deficiency while pregnant can affect your child’s peak bone mass later in life, says a 2018 report published in the journal PLOS One. The Norwegian-based study says that vitamin D deficiency is prevalent in pregnant women worldwide, especially during winter months in northern climates. You may have heard vitamin D referred to as “the sunshine vitamin.” That’s because our skin makes this important micronutrient after it’s been exposed to the big light in the sky. The farther away you live from the equator, the fewer opportunities throughout the year your body has to make vitamin D. Unfortunately, we can’t get enough of this vitamin from the foods we eat, says the Vitamin D Council. But you’ll find vitamin D in fortified milk and cereal and in fatty fish, beef liver and egg yolks. How much D supplementation you’ll need while pregnant will depend on your lifestyle, location and skin color. So be sure to talk to your doctor about this one. A vitamin B12 deficiency can increase the risk of preterm birth according to a recent study published in the American Journal of Epidemiology. And a lack of B12 can also make an already tired mother-to-be feel downright exhausted. Fatigue is a major symptom. The National Institutes of Health estimates that as much as 15 percent of the general population has a B12 deficiency. You might be missing out on this essential micronutrient if you have a gastrointestinal disorder that prevents absorption or if you follow a vegan or vegetarian diet. B12 is only naturally available in animal products. You can up your intake with eggs, dairy, meat, poultry and seafood. If you avoid animal products altogether, fortified breakfast cereals can help, or talk to your doc about supplements or B12 injections. Zinc deficiency increases the risk of low birth weight or of infants born small for gestational age, says a 2015 study published in the journal Scientific Reports. Zinc appears to have anti-inflammatory properties that are helpful to your growing babe. You’ll find big helpings of zinc in cooked oysters, crab and lobster. Or turn to red meat, poultry, beans, nuts, dairy and fortified cereals. Just as with B12, you’re more at risk for a zinc deficiency if you’re a strict vegan or vegetarian because this micronutrient is more readily available in animal products. Plant sources of zinc also contain phytates that inhibit zinc absorption, which is why vegetarians sometimes require 50 percent more than the recommended daily allowance of zinc, according to the National Institutes of Health. Tell your doctor if you’re following a special diet. If you’re low on vitamin C, you might have trouble gaining pregnancy weight and could experience complications with placental function, says a 2014 study published in the European Journal of Nutrition. In addition to helping you maintain a healthy pregnancy, adequate vitamin C can boost your immune system, says the NIH. So get fruity! You’ll find vitamin C in citrus fruits or fruit juices, strawberries, cantaloupe and tomatoes — as well as non-fruity friends broccoli and potato skins. Omega-3 fatty acids are the good kind of fats. Our bodies need fat, which is a macronutrient, for proper function. Omega-3s are poly-unsaturated fats (PUFAs for short), and they play an important role in healthy fetal development. Unfortunately, not all pregnant women are getting enough, according to a recent study published in the journal Nutrients. Cold-water fatty fish like salmon and trout will provide you with a nice helping of omega-3s; the Food and Drug Administration (FDA) advises pregnant women to eat two to three servings of fish per week. Use the FDA’s chart to determine choices low in mercury. You can also find omega-3s in chia seeds, flaxseed, flaxseed oil, walnuts, edamame, beans and eggs. More: Is There Really a "Right" Time to Have a Baby? Your doctor might evaluate you for specific deficiencies and prescribe or recommend prenatal vitamins to help, but you should avoid self-treating by grabbing random bottles over the counter. Taking too much of some supplements can be dangerous, warns the American Pregnancy Association. Be sure to discuss with your physician any special diet you might follow for health or environmental reasons or any changes you’re planning to make so that your doc can create a plan that’s best for you and the baby (or babies!) onboard.